My friend Riley Edgewood got me started on Bullet Journaling, a notebook organizational system that helps with structuring your days/weeks/months. I like it because it’s super flexible and easy to change up day-to-day or week-to-week. I’ve been using my Bullet Journal to track habits, make to-do lists, catalogue IG challenges, scribble down book ideas and revisions notes, and all sorts of other things. Here’s a comprehensive video, if you’re curious. I recently finished The Year We Fell Apart, a contemporary YA romance. I enjoyed it very much, particularly the way Emily Martin gender-flipped the bad boy/good girl trope. Declan was totally swoonworthy! Now, I’m reading Summer Skin by Kristy Eagar, because Aussie authors are the freaking best. Still obsessing over Game of Thrones and Outlander. I recently watched Laggies, which was entertaining and, in my opinion, under-hyped. My family and I saw The Jungle Book last weekend, which was InCrEdIbLe — such perfect casting. And my husband and I started watching Mercy Street, a PBS drama about two nurses who support opposing sides during the Civil War. It’s set close to where I live in Northern Virginia, so that’s fun. Our recent trip to President Lincoln’s Cottage, a beautiful house three miles from the White House where Lincoln and his family moved shortly after their son died of Typhoid fever (thanks to drinking water pumped right out of the Potomac). I had no idea this “cottage” even existed, but I’m so glad we left the beaten path to visit. The tour’s fantastic, and it was really cool to see a more humanized side of President Lincoln. Did you know he used to ditch his security detail so he could ride his horse into the city alone, and sometimes he’d pass by Walt Whitman and they’d give each other these respectful little bows? So cool. Highly recommend this spot if you’re ever visiting our nations’ capital. I’m typing this post yesterday (Monday, May 9th) and I’m HIGHLY anticipating the Fierce Reads event I’m going to tonight at the Bethesda Library. Marie Rutkoski‘s going to be there, and my inner fan girl is going cRaZy. You’ll check out the following Goodreads lists: YA Novels of 2017, YA Debuts 2017, 2017 Debut YA/MG Novels, and Books Published by Swoon Reads. Kissing Max Holden has found its way onto all of them, which is so exciting! Maybe you’d like to vote for my debut, or add it as “To Read”. I’m chipping away at my second round of Kissing Max Holden edits. I’m having tons of fun with a couple of Instagram challenges. I’m reading two amazing books. Summer’s right around the corner. There’s a lot about living in Northern Virginia that bugs me — the crowds, the terrible drivers, and the allergens, for starters — but one thing I’ll never complain about is the abundance of restaurant options. Coming from a small Florida town where the dining-out choices were Panera Bread, Firehouse Subs, and a mediocre sports bar, the possibilities in D.C. are mind-boggling. We’ve had amazing Latin American, Lebanese, Thai, and Iranian food, and most recently, we had “fast” food from Burger Tap & Shake, which was incredible. I had a falafel sandwich, sweet potato fries, and a cookies-n-cream shake — yum! If you’re ever in Foggy Bottom or Tenleytown, grab yourself some lunch. I recently finished Katie Van Ark’s The Boy Next Door, a YA romance set in the world of competitive pairs figure skating. It’s utterly unputdownable, and the character arcs are steep, which I loved. I also read Shannon Parker’s The Girl Who Fell, a contemporary YA about a girl who gets wrapped up in a manipulative, eventually abusive relationship. It’s really well done, and really frightening. Up next? Marie Rutkoski’s The Winner’s Kiss, which is out TODAY and is hands down my most anticipated read of the year. Excuse me while I disappear with my new book! Twinsters, which is the most heart-warming documentary I’ve ever seen. It’s the story of Korean twin girls who were split up as infants and adopted by two different families. They grew up on different continents, not knowing about each other until they serendipitously connect via YouTube. So good! Also, I saw Zootopia with my husband and daughter, and we all rate it 5 stars. It’s clever and deep and timely and funny. And, finally, the other night my husband and I watched As Above, So Below, a freaking scary movie set in the Catacombs of Paris. I’m kind of over the “found footage” thing, but I’m willing to forgive it in this case because the story was creative and wildly intense, and the atmosphere was dark and exceptionally terrifying. Ruby Red by Kerstin Gier — for some reason, I’d pegged this YA a super serious fantasy, but it’s actually a humorous and entertaining time travel novel full of voice and adventure. To me, it reads on the younger side of YA, but it’s fast-paced and all kinds of fun. The audiobook narrator is excellent, too. Plotting. Why is it so hard?! I’m in the process of drafting my sixth(-ish) manuscript, and I’m no better at planning a book than I was way back when I wrote that first (awful) story. And so, I’m reading Libbie Hawker’s Take Off Your Pants, a clear and concise book about plotting with the goal of increasing drafting speed and commercial appeal. I’m learning a lot, and having a lot of duh moments. Highly recommend reading it if you’re someone who’s struggling to become a more successful plotter, like me. Camp NaNoWriMo! I’ve got a 20K word goal for April, and I’m part of an excellent cabin of writers. I’m such a bad drafter, guys, and I love the idea of community when it comes to slogging through the muddled middle of a new manuscript, which is exactly what I’m in the midst of doing. Can’t wait to get busy in the new month! Springtime in Virginia. We’ve been having such beautiful weather. Tomorrow I turn 35. Yowza. If you’ve been following along for awhile, you know I set some goals two years ago, when I turned 33. I’ve crossed quite a few off the list, which makes me really happy. I’ve also stopped caring about accomplishing others. Others still, I’m hoping realize one day. And so, I’m giving myself more time. 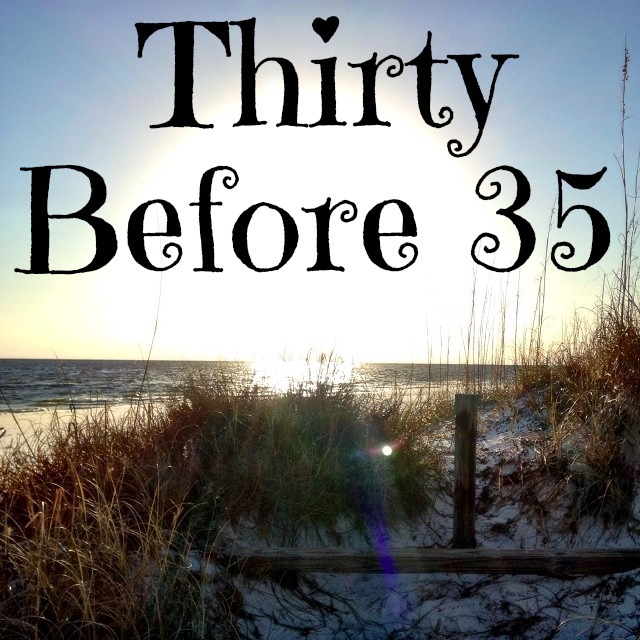 I’m going to revise my Thirty Before 35 list, and I’m going to start calling it my Life List. I’ll add to it occasionally, too, because surely I’ll come up with new goals as time passes. I’m excited! Sell a novel (or two!). Complete a 500 piece puzzle. Have a picnic on the beach. Read and review a Stephen King novel. Drink a Hurricane in New Orleans. Have professional family photos taken. Run Disney’s Princess 1/2 Marathon. Attend a writers’ conference or festival. Order a Stitch Fix box. Plan and host a tea party with my girl. Watch Friday Night Lights in its entirety. Complete a three day juice cleanse. Write a manuscript that’s not contemporary YA. Read Speak (my most shameful YA gap book). Add another child to our family. Master “Crow” pose in yoga. Go to a(nother) country music concert. Teach my daughter to swim (really well). Welcome another child into our family. Interact with a koala bear. If you remember back to my last Currently… post, I mentioned I was reading The Weight of Feathers by Anna-Marie McLemore. Well, I finished, and I loved it — it’s definitely a new favorite. Please, please, please pick it up! I also recently finished These Vicious Masks by fellow Swoon Reads authors Tarun Shanker and Kelly Zekas, and it was SO much fun. Protagonist Evelyn is the best sort of snarky, and the “Jane Austen meets X-Men” pitch is spot-on. Recommend! Now, I’m reading The Love that Split the World by Emily Henry and it is aMaZiNg so far. Guys, I’m so lucky — I’m picking up the BEST books this year! Kendra Akins on YouTube. She posts videos on health and beauty and lifestyle. I love her makeup-focused videos most. I’ve learned tons about the big name brands, as well as lesser-known natural products. Check her out if you’re into beauty and/or healthful eating — she’s super savvy. I recently listened to Colleen Hoover’s November 9, which was everything I was hoping it’d be: romantic, but also angsty and overwrought — a total guilty-pleasure listen. If you can overlook some slight but irritating misogyny, you’ll likely be entertained. And I just finished Keith Donahue’s The Boy Who Drew Monsters, a creepy adult horror. Different from my usual fare, but I liked it! Wrapping up the Kissing Max Holden revision I’ve been working on since Christmastime. I’ve completed all of the big-picture changes, and now I’m in the midst of a read-through, doing all the fun fine-tuning stuff. Yay! My new yoga studio! My husband bought me a membership for Christmas and it is aMaZiNg. I’ve practiced yoga for several years now, but mostly at home. I’ve never consistently attended classes, but after just a few short weeks in the studio with instructors who are deeply knowledgeable about the practice, I’m hooked. 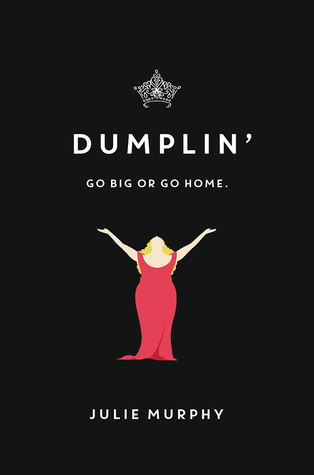 Julie Murphy’s sophomore novel, Dumplin’, a contemporary YA about a small town girl who loves Dolly Parton and ends up an unlikely participant in a local beauty pageant. So far, it’s as glorious as its cover. My husband and I just caught up on Homeland and, as per usual, my favorite character appears to have died in the season finale. I’m sad. My falling in love with a TV character pretty much guarantees his or her demise, which is why I don’t watch much TV. The new season of Serial, for starters. It explores the case of Bowe Bergdahl, the Army soldier who was held as a POW by the Taliban for five years. I have a lot of feelings about Bergdahl and the circumstances under which he was captured, and I’m finding Sarah Koenig’s reporting compelling as usual. 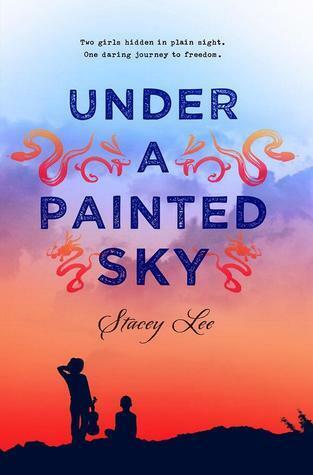 I’m also listening to a YA historical fiction, Stacey Lee’s Under a Painted Sky (using the new-to-me OverDrive app). I’m enjoying the story and the narration very much. My upcoming writers’ retreat! I get to spend four days in a lovely Maryland house with five of my favorite writer buddies. I’ve got plenty to do as far as my Kissing Max Holden edits go, and I’m super excited about a girls’ weekend away. Can. Not. Wait! Guys, I signed a publishing contract. I have an amazing editor, and an edit letter I believe in. Kissing Max Holden is on Goodreads. I have an author page on Facebook. In 2017, my book is going to be a BOOK. How can I not be happy? !